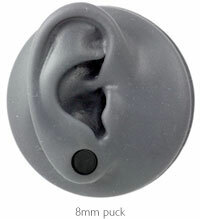 Hypoallergenic Blomdahl black titanium 8mm puck stud earrings with titanium butterfly backs. Very nice and light earrings, and the only drawback is that I lost the back of one of them at the very first wear. I could not even tell when it went away - there was only one earring in the ear when I looked in the mirror in the evening. I found a second one on the floor, but no trace of the back. Maybe it went apart while I was taking the scarf off. Be careful with the locks! These earrings are lovely quality and a joy to wear. I hadn't worn earrings for a very long time because of my allergy to most metals except white gold (very expensive) until I googled and found Serenity. I didn't even realise hypoallergenic earrings existed. I can wear these earrings round the clock whereas with other metals I have to take them out within about an hour because they start to feel very sore. I'm so pleased with these earrings I will definitely return when I need more as they represent excellent value for money. Many thanks! I actually just adore these earrings, they are my stay in one's. Have had them in since I got them! No bother with allergies, and comfy, almost forget they are in, as very light too. Thank you!! Got the smaller size and they are perfect. Love these earrings. I have had a compliment every time I wear them, as they are so unique. I think they are the perfect size and very lightweight. 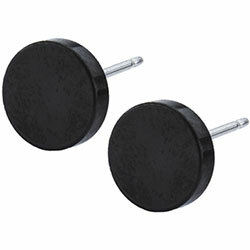 Very cool studs, great for people with sensitive ears! For the past two years or so I haven't been able to wear normal earrings, as my ears got red and itchy after only a few hours of wearing them. I've had these studs for a few days now and I've been wearing them basically all the time, and my ears are absolutely fine! So happy!! And they look really cute, too.